At the garden of his grandparents, who the just four years old Bob skating on the Nieuwkoopse lake. Without hesitation, he moved with his red boots on the ice, lay his hands behind his back and drops iron remains unter the shoes. In the summer, he experimented with his roller skate on the grass and he came forwards, really! In 1981, Bob went to the local skatingclub 'Nut en Vermaak' (utility and entertainment) every Saturday from Leimuiden to the ice rink in Leiden. Little Bob was no longer off the ice and at the end of the winter ice, he received his first degree. He also played football and swimming, it was the best for him. The complete Saturday was filled with sporting activities. Only the broadcasting of skating competitions on television, prevented him leave the house. In the hard winters of 1985 and especially 1986, did Bob not go to school. For in these years, the legendary "Eleven Cities Tour” was obliged to and he did n’t miss any minute. Coinciding with the winner Evert van Bentum he went into his living room on his "own" imaginary finish line. This week, Bob skated with the school his first 10,000 m on natural ice. Even then he could measure up to five years older boys, and came together with them to the finish. In 1987, Bob moves from 200m to 400m track in Haarlem. He was then not praised for his fast times, but for its clean technique. In February 1992 maked Bob his debuted at the national championchip fights of the C-juniors and was surprised to know spot 7. In Munich, he pulverized in the same year the 3.000m track record, and brought many eyes to wonder. The until now most successful junior coach Leen Pfrommer saw an ideal member for his 'Junior national Team'. In 1995 he won his first national and international title at the Junior World Championships in the allaround in the Finnish Seinaoki. 1996 Bob repeated his exceptional performance with a Dutch record in the 5000m and the 3000m world record. To everyone's surprise, he said in the same year ’No’ to a start at the senior World Championships starting. He had enough for this year, because he was successful as none before, and knew about other opportunities in his career just started. On 7 November 1996 Bob make his World Cup debut in Berlin. This season, he was the first at the then new klap-skates. He won directly at the age of 20 years, two World Cups and the bronze medal at the World Championships in individual races. 1998 Bob made his Olympic debut. According place 4 over 5000 meter, he blossomed his still young career with a 2nd place on the 10.000 meter. The silver medal he received from 'his' Crown Prince Willem Alexander, a real special moment. In the following years, he proved again his special exception on the long distance and collected several medals at World Championships. His first title in 1999 he won the 10.000meter in the domestic Heerenveen. His big moment was defeated at the 2002 Winter Olympics in Salt Lake City. He won the national trails and went as a big favorite at the start. Is well known, but Olympic has its own laws. Everybody told him long in advance as the winner and virtually invincible. What followed took the nation and its fans in deep mourning. Bob failed on his nerves, the pressure of an entire nation and all the high expectations. On the 5000m, as well as the 10000m went completely in the almost inhuman stressful conditions by and the medals were unknown in the far away for him. Many Dutch shed bitter tears, together with Bob. But a great athlete like Bob, draws strong will and ability to be able to put away from defeat. He went back to his roots. For two years he trained with students in a regional team near his home. 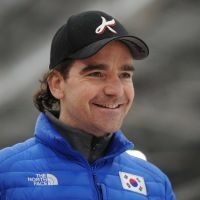 The team-members, the good mood and motivation brought Bob back a year later as an overall World Cup winner on the long distance on the road to victory. In the follow years he toke medals after medal at the international races. Bob completed his training and went to work like any other person. In 2004-2005 he moved to a prof-team again with World class Skaters, and he did well the winter with great times, and qualify him to when the World Allround, his endurance class brings up to 7th place. Later that winter at the World Single in Inzell, he’s show his world class and did win the Titel and a second placement. In 2006, Bob was again able to realize his dream of the great opportunity to Olympic gold. In Turin, the then scraped for the `Team` Telfort taking off at the podium by just Bob and finished 6th about 5000m. After a quiet and withdrawn in preparation for South Tirol mountain village Collalbo, Bob used his mental and physical fitness to win gold. In an extraordinary race he faced down in 13:01,57 against its biggest rivals, and realized his dream of gold in Turin. The biggest moment of his successful career. Champagne glass was still full, Bob began no new offer from his old team success fully Telfort, and now? Contact Bart Schouten move to America was her already, but Bart came to Germany and he followed the German team has the talent to thrive on new heroes. Accuses him to Berlin in September 2006 and as an unofficial member of the German team. In the summer of 2006 was Bob participation in TV show ‘Peking Express’ after 12day in India and 8kg lighter, did he start the training, and Skate like a dabbler. after 3 month his Power-legs comes back, but not enough to qualify for the Worlds 2007. The new Summer begins to dance briefly with during the 'Dancing with the Stars' TV show, a fourth place would fit the requirement and start in May with a fit dance body to starting the next dream. In 2008 started good with World Cups podium, only Bob missed starting place at 5,000 m on the World Single Distance Championship but on the double distance, he wins bronze at 10 km and thus grabbed his 14th Medal in Nagano . The season after is Bob back and win in November 2008 his 10th World Cup, is clearly at the World Championship in Richmond 2009, the proper preparation is under way and after a good 5km Bob take the bronze medal on 10.000 meter back home. His Olympic experience were broken with a back injury, he couldn’t take his skating position for over 3 minutes but with tape and pain blocker was his 3th place a great suprice, another olympic medal. Career end were subjected to quit skating outside the Speed skate hart claimed Bob and there should not have been running the new destination in marathon Skating. With Jillert Anema a new coach and a team with a long track-men another influence. And wenn the season was started, he won his national championship and all the World Cups. At the World champions the Titel in 5 and 10km in Inzell 2011. In June 2011, Bob received the coveted Oscar Mathissen the jury of Oslo Skating Club, this "skate Oscar" is given annually to a skater with a special performance of 2011. In the Netherlands, he was nominated for Sportsman of the Year. In addition to all the training he had hired for a job at BAM as stadium developer, work experience, and to find a new challenge. 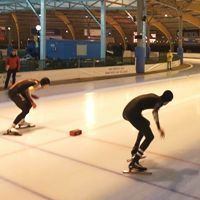 Despite all the challenges that he drives in the winter to the victories, his form was really clear after World Cup victories in the World Champions in Heerenveen and won a silver over 5km and win his seventh world title on 10km. 2012: On the longtrack starts with great races he won the World Cup's first series, he won the World Cup 10km. Inzell during the World Cup and in Erfurt In the overall classification he proposed on the 2nd place safely. At the World Championships in single distances Soshi toke his 20th medal on the 10km, itself was not very happy with it "I have a chance at a world leave here, title a bronze medal collection is an addition to me, not more "
In November 2013 he breaks his personal record on the 5km, ready to the Olympic trails. At Christmas time he missed the 5km on 0,3 sec and on 10km he shows his specialise with a great race. In Soshi was’t that good but wins his fourth Olympic medal within five games, ‘my communication with coach was troublesome, maybe I have to break before the games but…” and break up after the games. in April 2014 he shows up in a television program ‘Atlas’ in the rain woods of Suriname . in Juni he start up with Johan de Wit as his new coach, in a semi prof team. Won his 20th World cup in Seoul. At the trails he was DQ under discussion but missed his goal this winter. On Juni 26 2015 he decide: “it wil be my last winter as a skater, after 20 year on this level must be more time for other goals” and “I go to Calgary to train with the national team for this summer” with Bart Schouten as his trainer, he want to focus on skating, a couple good races to go. World record ? win another titel or world cup will be great.